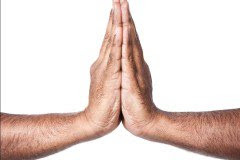 Many times in yoga, usually when sitting cross legged or when doing Savasana, a relaxing pose that is much like a wide awake nap (I have drifted off during it) we are told to touch our forefinger and thumb together and keep the others loose. I always wondered the reason for this. This is called a mudra and for this move it's know as the Guyana or Chin Mudra. Mudra means "seal" in sanskrit and is used to channel a body's energy flow. 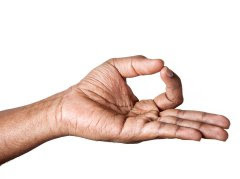 According to Yoga Journal.com in this mudra the index finger represents individual consciousness and the thumb represents universal consciousness. The index finger represents the limited perspective of self and the thumb is the expanded perspective of Self. When the two join, the limited self is connected to the spacious Universal Self. This mudra creates a more receptive state and also calms the mind. It also helps to get rid of "dull energy" and brightens a persons mood. I have met many cranky people who could use this. Placing your hands together is known as the Anjali Mudra. The hands are placed together and held in the heart area honor and is used to express love, gratitude and the respect you have shown yourself and the universe. It all may sound airy fairy but I use these daily in my affirmations and visualizations and must say, they do help.